Woody Norris, the master of miniaturization, has developed a tiny voice recorder that he believes could revolutionize the recording industry. 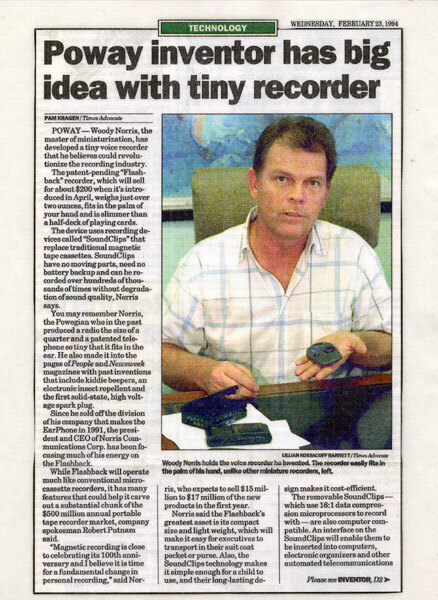 The patent-pending "Flashback" recorder, which will sell for about $200 when it's introduced in April, weighs just over two ounces, fits in the palm of your hand and is slimmer than a half-deck of playing cards. The device uses recording devices called "SoundClips" that replace traditional magnetic tape cassettes. SoundClips have no moving parts, need no battery backup and can be recorded over hundreds of thousands of times without degradation of sound quality, Norris says. You may remember Norris, the Powegian who in the past produced a radio the size of a quarter and a patented telephone so tiny that it fits in the ear. He also made it into the pages of People and Newsweek magazines with past inventions that include kiddie beepers, an electronic insect repellent and the first solid-state, high voltage spark plug. Since he sold off the division of his company that makes the EarPhone in 1991, the president and CEO of Norris Communications Corp. has been focusing much of his energy on the Flashback. While Flashback will operate much like conventional microcassette recorders, it has many features that could help it carve out a substantial chunk of the $500 million annual portable tape recorder market, company spokesman Robert Putnam said. "Magnetic recording is close to celebrating its 100th anniversary and I believe it is time for a fundamental change in personal recording," said Norris, who expects to sell $15 million to $17 million of the new products in the first year. Norris said the Flashback's greatest asset is its compact size and light weight, which will make it easy for executives to transport in their suit coat pocket or purse. Also, the SoundClips technology makes it simple enough for a child to use, and their long-lasting design makes it cost-efficient. The removable SoundClips--which use 16:1 data compression microprocessors to record with--are also computer compatible. An interface on the SoundClips will enable them to be inserted into computers, electronic organizers and other automated telecommunications products. Putnam said AT&T and IBM are set to introduce voice-to-text microchips later this year that can work with the SoundClips. Despite their size, the Flashback will have all the features of traditional cassette recorders, including record, play, fast forward, rewind and pause. Besides that, users will be able to insert or edit messages without erasing or recording over subsequent speech. Flashback also has the ability to scan recordings at either a high or slow rate of speed without altering the pitch of the voice, Putnam said. The SoundClips, which will be sold separately, will be available in 30-minute versions priced at $50. Norris said 60-minute and 120-minute SoundClips will be available within a year. The price for SoundClips is expected to drop significantly after full-scale production is under way, Norris said. Most of the manufacturing of the product will be done by American Surface Mounted Devices, a San Diego company Norris purchased in the late '80s and moved to Poway. ASMD specializes in manufacturing miniature printed-circuit boards for electronic components. Its clients include Kodak and IVAC. Flashback and SoundClips will be sold through distributors, retailers and catalog merchants and also be sold under private label to OEMs, or original equipment manufacturers, Putnam said. 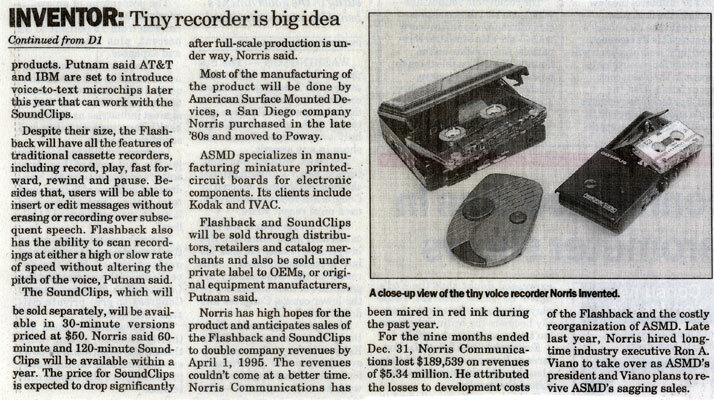 Norris has high hopes for the product and anticipates sales of the Flashback and SoundClips to double company revenues by April 1, 1995. The revenues couldn't come at a better time. Norris Communications has been mired in red ink during the past year. For the nine months ended Dec. 31, Norris Communications lost $189,539 on revenues of $5.34 million. He attributed the losses to development costs of the Flashback and the costly reorganization of ASMD. Late last year, Norris hired longtime industry executive Ron A. Viano to take over as ASMD's president and Viano plant to revive ASMD's sagging sales. Woody Norris holds the voice recorder he invented. The recorder easily fits in the palm of his hand, unlike other miniature recorders, left. 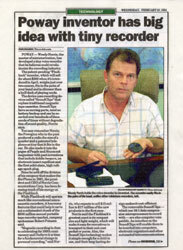 A close-up view of the tiny voice recorder Norris invented.